The movie gets an automatic half point deduction because it was so intense and gripping that I had to leave the room a few times and scream to my family, “What’s happening now?” I have to assume there were some problems with the picture during those moments. 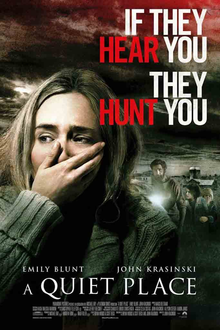 Otherwise, John Krasinski’s sophomore effort as a director is taut, assured (you feel he really had a vision as to almost every scene), and at the right times, edge-of-your-seat terrifying. It is also bolstered by wonderful performances that are necessarily non-verbal. Krasinski is moving as a beleaguered father trying to protect his family, and Emily Blunt’s travails as she communicates them are almost too much to bear. The only thing you need to know about the plot is that the monsters can hear EVERYTHING!